The thing about Pure Mental Focus is that you need it to last throughout the day, or at least for a few solid hours (meaning 4-5 minimum). If a supplement claims to bring focus but can’t achieve that, then it’s really not worth even giving it a shot. We’re sad to have to admit that a lot of cognitive enhancing supplements out there have failed to meet their promises. Then again, we have come across a few that not only perform according to what the manufacturers say but even exceed expected results. We hope that Pure Mental Focus by Purely Stacked belongs to the latter group. Only one way to find out and that’s by looking at the product’s ingredients and testing its results. Time to review another focus-boosting product! Purely Stacked has a very creative marketing team. Right as you land on their official website, you’re presented with a cartoon video that addresses the problem most people have (lack of concentration) and presents the benefits of Pure Mental Focus in a clever but straight-to-the-point way. There’s a very good chance that you’ll be sold by the product after watching this video, which shows that Purely Stacked has got their marketing techniques down to a t.
Vitamin C: Helps maintain overall health. Vitamin B6: Promotes better mood by interacting with the mood regulating neurotransmitter, serotonin. Potassium: May help reduce anxiety. L-Tyrosine: Battles stress by aiding the production of dopamine and epinephrine. L-Phenylalanine: Helps to boost mood. Taurine: Reduces anxiety and fatigue. Grape Seed Extract: Packed with antioxidants that help maintain cell health and function. Potassium Ascorbate: Works similarly to Potassium & Vitamin C in maintaining overall health. DMAE: Reduces brain fog, boosts mental alertness, increases focus. Ginkgo Biloba Leaf Extract: Stimulates blood flow and supports concentration. CoQ10: Helps with cell energy production and provides antioxidant protection. In terms of price, Pure Mental Focus is great. In terms of value, however, it’s not the best option out there. The formula includes some decent nootropics but it certainly misses out on any of our favorites such as Noopept, Piracetam, L-Theanine, Vinpocetine (which are our favorites for a reason, by the way!). Some people find that it does work to release extended focus, while others find that the formula is far too weak. 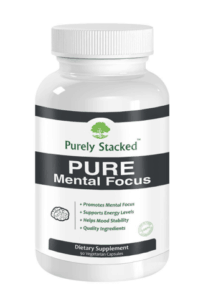 In our opinion, while Pure Mental Focus isn’t a bad product, it doesn’t quite make the cut to be in our top favorites. Suit yourself, but we believe that you deserve the best.